Click an image below to view a full gallery of each project. The owners of The Chemist Distillery and Apothecary Beverage Company have embraced a vintage aesthetic to establish a nostalgic atmosphere and to honor the tradition of distilling quality spirits. They hired Brushcan Murals to create their signage and a collection of murals that enhance this vision. Multiple elements are also being used for branding and merchandise. The owners of a restaurant with a 400 ft long retaining wall wanted to brighten the area up with a mural that depicted landmark places around Asheville. We created a light hearted style for the long wall that starts in the mountains, follows the Blue Ridge Parkway into downtown and the back out into the mountains. Met with the owners of this outdoor music venue located at an old salvage yard to paint emergency response numbers on multiple buildings. 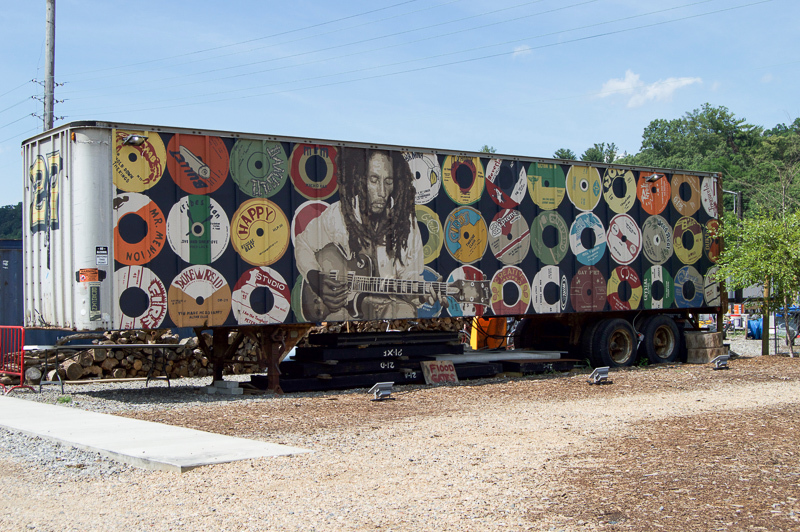 They also wanted a mural of Bob Marley on the side of a semi trailer. While on site we began talking to them about paint ideas for an outdoor freezer unit and a 40 ft Quonset hut. We painted the freezer to look like a wooden fruit crate full of albums and the Quonset was turned into a vintage beer can. Met with the owner who was looking for a mural and theme for the expansion bar and game room of the restaurant. They suggested a county fair/ carnival theme. 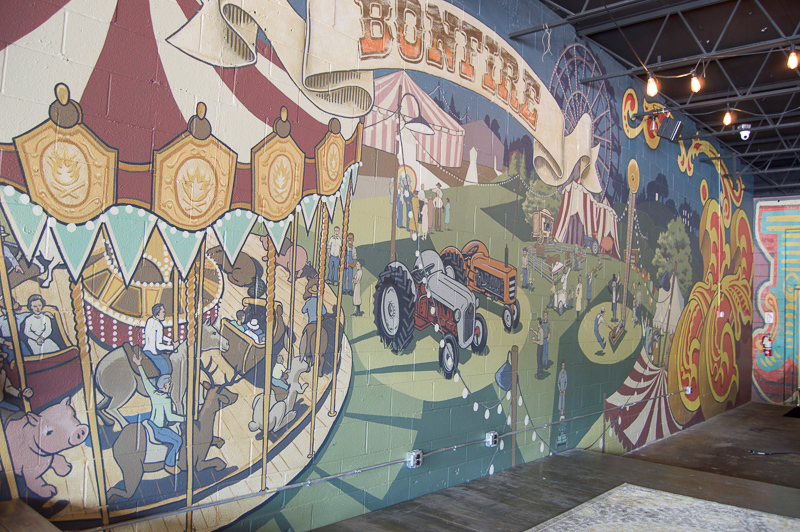 We used a light hearted style for the main wall and an aged vintage style for the bar wall that was based on historic fair games. We painted the front exterior facade of the building with a graphic style that tied into the interior as well as expanding the sign. Our most recent State Park diorama. We were contacted by NC State Park Commission when a small 6'x6' black bear display needed a new background. Diorama painting requires much more subtle detail due to the close viewing distance and to create the illusion that the background is an extension of the real objects in front of it. We were approached by the owner of several connected buildings downtown. He wanted an old sign painted on the wall in their private parking area outside of his office. We pitched him on the idea of multiple "ghost signs" covering all of the walls. As if they had been painted with different advertisements over the last century. We chose to represent some old Asheville businesses along with other random old ads. Paint was applied in layers and in various ways to give the appearance of multiple years of age. Owners requested something to make their building stand out more than just a fresh coat of paint. A similar graphic approach used on the bike shop mural was incorporated to show transmission parts, as well as a "transmission city" made of gears. Sullivan & Chase Architecture was looking to draw attention to their new multi tenant building on a four lane street. 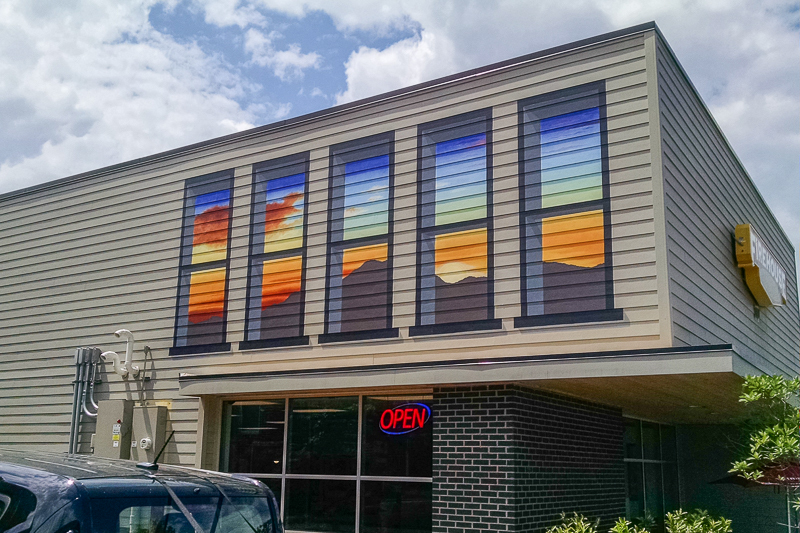 Working within a smaller budget, we painted graphic dimensional windows with a bold mountain sunset. Contracted to re­paint a 100 year old Coca­Cola sign. Original sign was painted out during 2 year filming of a TV show. We re­created the graphic with durable up­to­date products then aged it down slightly to give it an historic feel. This K­-8 school was looking for two projects; a mural on a large blank wall in their entry hallway and something to dress up a ticket window in their theater/ auditorium. We designed the hallway, working with the schools set of 4 core values as well as students learning and creating. This was painted on panels in the studio and installed. The ticket window was painted as a light hearted gold picture frame. They liked this so much that they wanted to continue it around bulletin boards and other windows. This small retaining wall mural was donated to the East Asheville Sidewalk Initiative, who got sidewalks built from the VA Hospital into town. This bus stop retaining wall sits at the halfway point at Beverly Hills and Tunnel Rd. 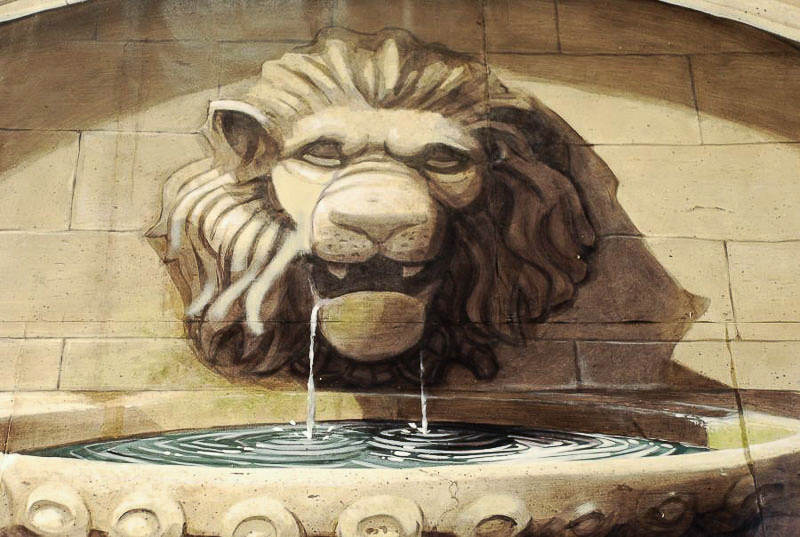 Trompe l'oeil painting of a small water fountain. 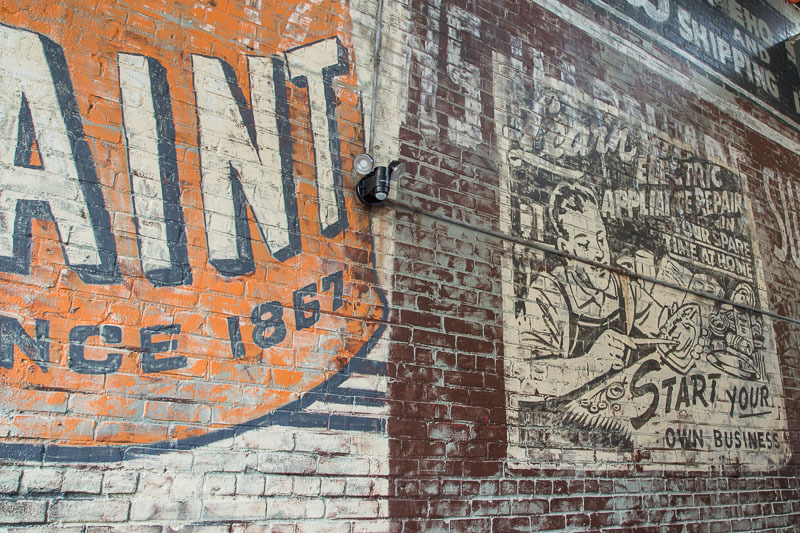 A fly fishing outfitter in Asheville wanted a mural on the side of his building that faced town. Located on the edge of a historic neighborhood, we designed a very classic mural from the vantage point of being underwater looking past a 20' long rainbow trout. Due to the limited access to the wall, this mural was painted in the studio and applied in pieces using the "poly tab" technique developed by legendary California muralist Kent Twitchell. Painted 3 new murals inside this pizzaria & brewery that also has a movie theater. 1. A 1950's style postcard that shows Asheville landmarks and activities. 2. A pulp­comic style outer space panorama, with various spacemen directing you to the entrance of the theater and carrying pizza and beer. 3. Bar back wall, this one took inspiration from all of the brewing equiptment directly behind the wall. A series of pipes, tanks, and valves criss cross in a maze all leading down to the beer taps. These murals were painted in the studio on canvas and applied to the wall to reduce the amount of time on site in a busy restaurant. 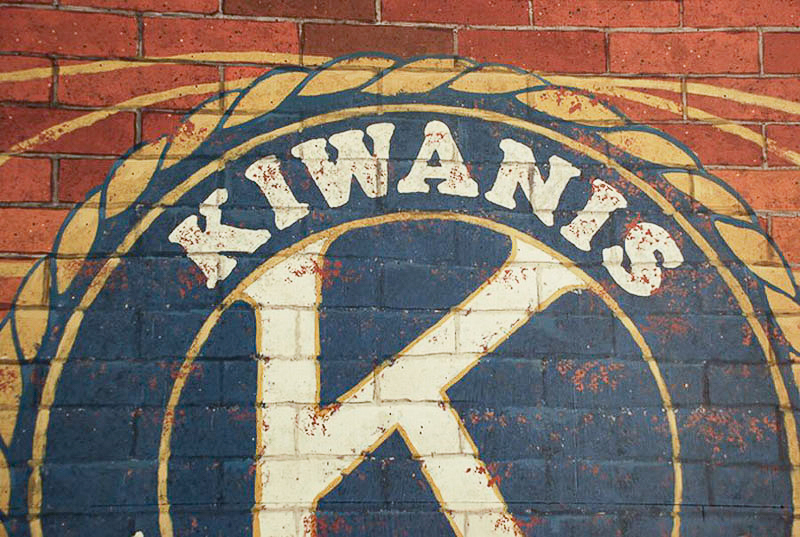 Trompe l'oeil brick wall with aged Kiwanis Club logo. Painted to commemorate their 50th anniversary. We were hired to do scenic paint (aging/ distressing) on a boat and a fishing shack at a children's museum. While working, we pitched them on the idea of an undersea coral reef mural around the entire room. The owner of a bike shop with 3 walls on a busy street wanted to call attention to his business. We found a creative way to show "bike shop" without the standard image of a person riding a bike in the mountains. All of the circular items of different bikes were arranged in a graphic pattern.